David Gregory has faced a recurring nightmare that still wakes him up in tears nearly one year after a massive fire tore through an Oakland warehouse, killing 36 concert-goers in the city's deadliest blaze in history. Gregory's 20-year-old daughter, Michela, was among the slain, and in the dream Gregory can hear her calling his name and screaming for help. "And there's nothing I can do," he said during a recent telephone interview, his voice quivering with emotion. "I always wake up crying, and it happens a lot." 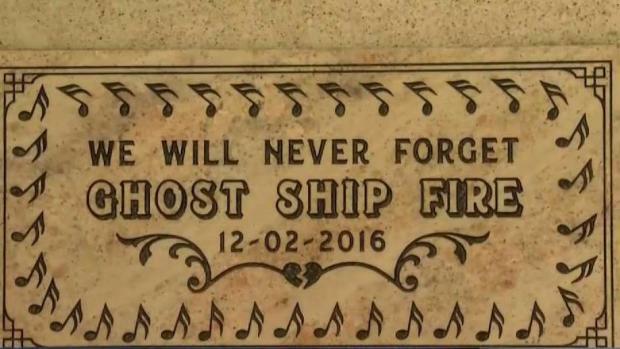 The first anniversary of the fire at the building known as the Ghost Ship, which arrives on Saturday, is bringing back painful memories for Gregory and other victims' families. Saturday marks one year since a massive fire tore through an Oakland warehouse, killing 36 concert-goers. Mourners will have chances all weekend to honor the lives lost. Bob Redell reports. "You never recover from it," said Mary Alexander, an attorney who is representing Gregory and other victims' families in a lawsuit that names the city, the warehouse's owner and its operator. "All of them are anxious about the one-year. It's creating a lot of emotions." The warehouse was a gathering place for artists and musicians, a number of whom were at 1305 31st Ave. for an electronic music event that was not permitted by law. The structure, which was powered by a labyrinth of electrical cords, ignited, trapping dozens of people inside. The structure had no fire alarms or sprinklers. Most of the 36 people who died just couldn’t get out in time and succumbed to the smoke inhalation. The city of Oakland was criticized afterward for not having shut the place down in spite of previous visits by police and fire officials. Mayor Libby Schaaf said city leaders have learned lessons from the tragedy and are improving residents’ safety. She also vowed never to forget the victims. "We will learn all we can from this horrific tragedy to make Oakland a safer and more resilient community," she said in an executive order directing city officials to prioritize building inspections, audit the fire department's inspection bureau and create a database to share information about problem buildings across city departments. A city report in November touted Oakland as safer since the blaze, but some officials have a more mixed assessment of the city's efforts, criticizing them as slow and incomplete. Just months after the Ghost Ship blaze, a fire at a dilapidated building killed four people, reinforcing criticism that Oakland was inept after emails showed a fire captain recommended shutting the place down weeks earlier and another fire official warned it was dangerous. The city is more than doubling its number of fire code inspectors, but the full contingent of 20 inspectors won't be in place until the end of 2018. The database to share information about problem buildings also won't be up and running until next year. The system is considered vital after the Ghost Ship fire exposed communications breakdowns between officials. Records show in the months before the blaze, city officials received numerous complaints about the warehouse and police repeatedly visited the site. Inspectors had knocked on the Ghost Ship's doors a few times, but none had stepped inside the warehouse for at least 30 years. Dan Robertson, head of the union that represents city firefighters, said the city is moving in the right direction. "But we'd like to see change come a little bit faster and perhaps with more dedication of resources coming directly to the fire department, he said. Rebecca Kaplan, an Oakland councilwoman, said she was "very concerned about the number of things that haven't been done yet." City spokeswoman Karen Boyd did not comply with a request for interviews with city officials. Since the Ghost Ship fire, the city has investigated 32 warehouses or commercial spaces that were suspected of serving illegally as housing, work or gathering spots and scores of other properties with multiple hazards identified by firefighters, according to its November report. The city also got a new fire chief in October. The Ghost Ship fire highlighted the precarious living situations of artists seeking affordable housing amid skyrocketing rents in the Bay Area. In its wake, Los Angeles, Baltimore and other cities cracked down on commercial spaces that were used illegally as housing or performance venues. The Ghost Ship fire was the deadliest U.S. building fire in more than a decade. Schaaf said in her January executive order that Oakland wanted to avoid displacing "vulnerable community members" while improving safety -- a balance that can be tricky to achieve. The city is working with the owners of 16 of the 32 commercial properties to address residential violations, but acknowledged many owners have evicted tenants instead of trying to bring their properties up to code. Prosecutors, separately, have charged two men, Derick Almena and Max Harris, with involuntary manslaughter in the blaze. Almena rented the warehouse and lived there with his family. Harris also lived in the building and helped Almena book musical acts and sublet the space to artists looking for affordable housing. Prosecutors say the men knowingly created a firetrap and deceived the building's owner, police and fire officials about the fact that people were living there. The two have pleaded not guilty and say they are being scapegoated. In their lawsuit, the victims' families say the city knew the Ghost Ship was a major fire risk but took no action to protect its occupants. Police body camera footage obtained by the East Bay Times shows officers visited the warehouse site multiple times in 2015, once talking to Almena and threatening to shut it down. A judge in a Nov. 8 ruling indicated he was not inclined to allow the city to avoid the suit, saying there was "no question of the authority and obligation of the city to act when faced with an unsafe and substandard building." Gregory, 49, said he hopes the city "will do what's right." He recalled going through denial in the hours after the fire, as he tried to contact his daughter but didn't want to believe she was at the party. "I know it happened," he said. "It's been 12 months. She's not coming home. But it hasn't gotten any easier." On Friday morning, the Chapel of the Chimes in Oakland – where a plaque reading “Ghost Ship Fire: We Will Never Forget” is housed – will open its doors so people can commemorate the lives that were lost. It is located at 4499 Piedmont Ave. in Oakland. “This is a chance to gather together in community, to remember the victims of the Ghost Ship fire, and to inspire thinking about our shared future,” a Facebook event page reads. A pop-up memorial will be found at the Oakland warehouse at 4 p.m. and a community vigil is scheduled at 7 p.m. Separately, the New Parish at 1743 San Pablo Ave. in Oakland will host a “Ships in the Night” benefit from 11 p.m. Saturday to 2 a.m. Sunday for survivors of the fire as well as the families of the victims. San Francisco dance clubs are urged to hold a moment of silence between 11 p.m. Saturday and 12 a.m. Sunday in honor of the people who died. --Bob Redell contributed to this story.